It’s the first day of Ice Cream Week! 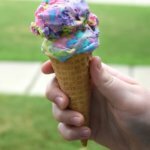 There’s a giveaway, and I will be bringing you some deliciously fun ice cream flavors all week long as and so will a few other bloggers, too! 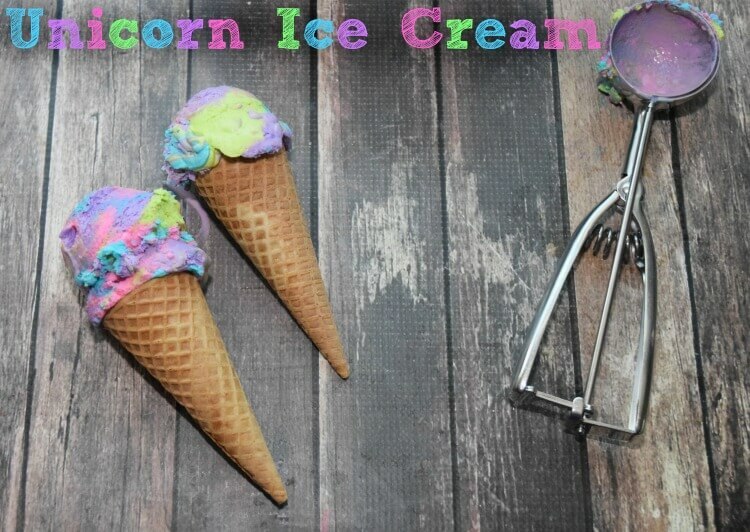 Today’s flavor is my kids absolute favorite — Unicorn Ice Cream! First off, I do not own an ice cream maker, so this is definitely a no churn ice cream. This recipe is incredibly easy. It’s a can of sweetened condensed milk, whipping cream, and vanilla extract. That’s it! Start out whipping the whipping cream in the electric mixer on high. As it begins to whip, slowly pour the can of sweetened condensed milk into the whipping cream. Then, when it’s forming soft peaks, add the vanilla. Whip for another minute. 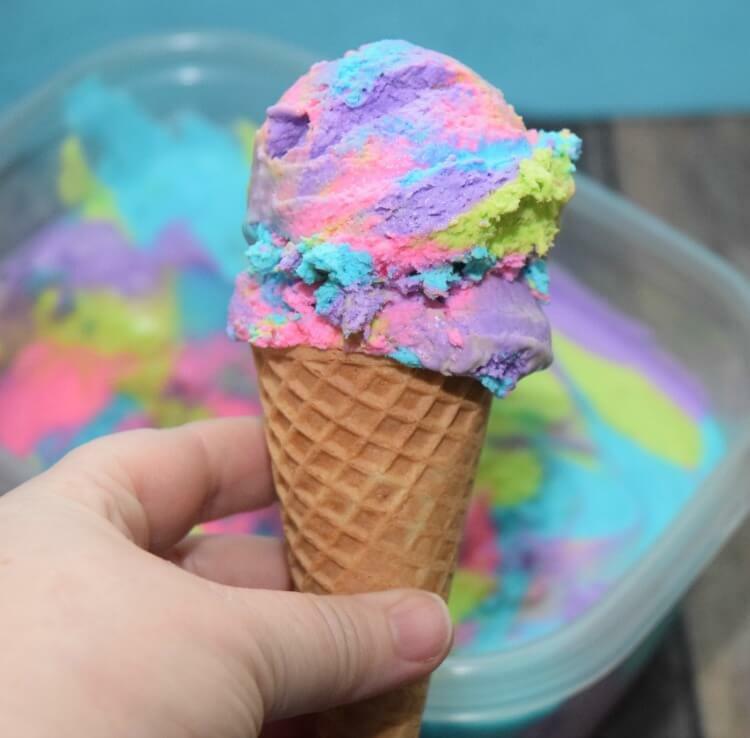 Unicorn Ice Cream is a rainbow of pink, purple, green, and turquoise. So, I evenly divided the whipping cream mixture into four bowls. Next, I used food coloring gels because they are much more vibrant than the drops. This is more of an eyeballing thing. I just kept adding a little bit at a time to get the color I wanted. Next, I add a heaping spoonful of each color at a time overlapping the colors over and over and vary it as I go. I use these freezerware containers for all my ice cream recipes. They have lids and don’t let in the freezer burn. When I’ve added all the colors, I tap the container on the counter a few times to flatten out the mixture, and in the process, it swirls it a little. Cover the ice cream and freeze it for at least 8 hours. I keep it in the freezer overnight so it hardens up nicely. This is a perfect ice cream for a treat, birthdays, and more. It’s a sweet delicious cream flavor with a hint of vanilla. Your kids are gonna love it! In an electric mixer, whip the whipping cream on high. Slowly pour in the sweetened condensed milk. When soft peaks form, add the vanilla. Continue whipping for another 1-2 minutes. 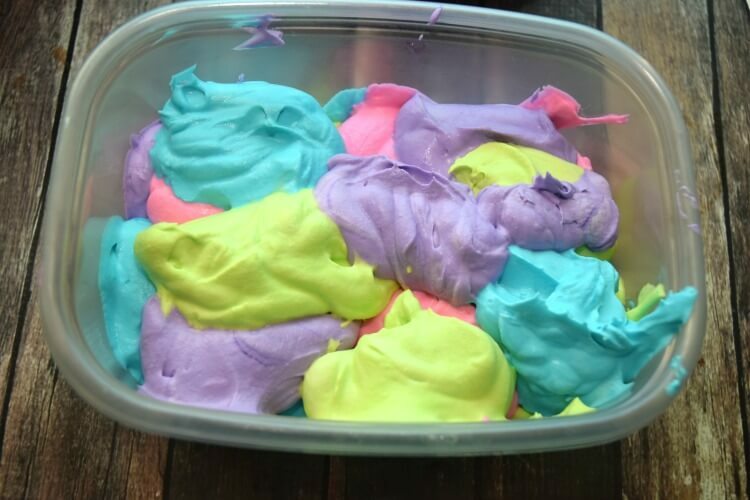 Add one gel food coloring to each bowl – pink, blue, green, and purple. 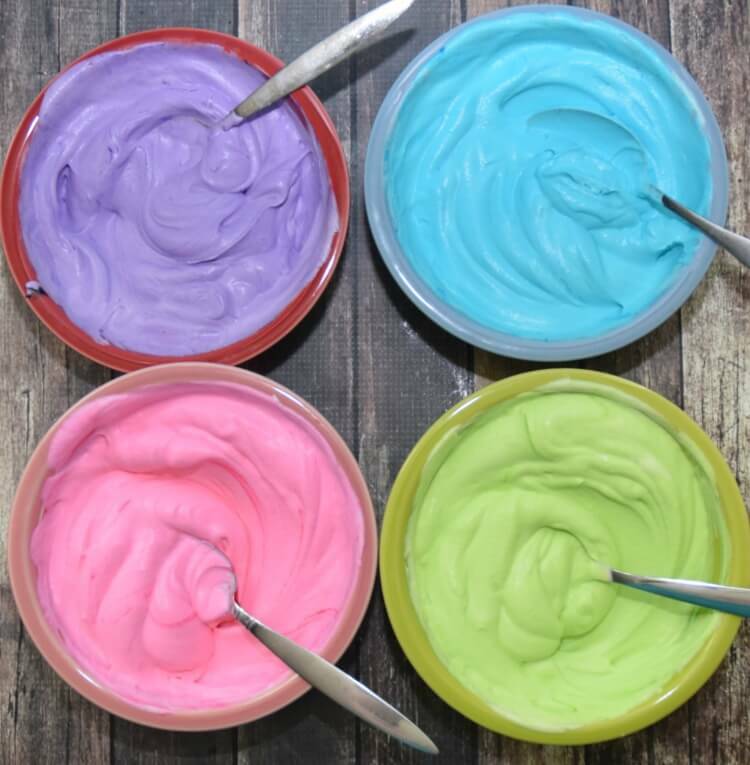 Mix each with a spoon and add more food coloring as necessary until the color you want is achieved. 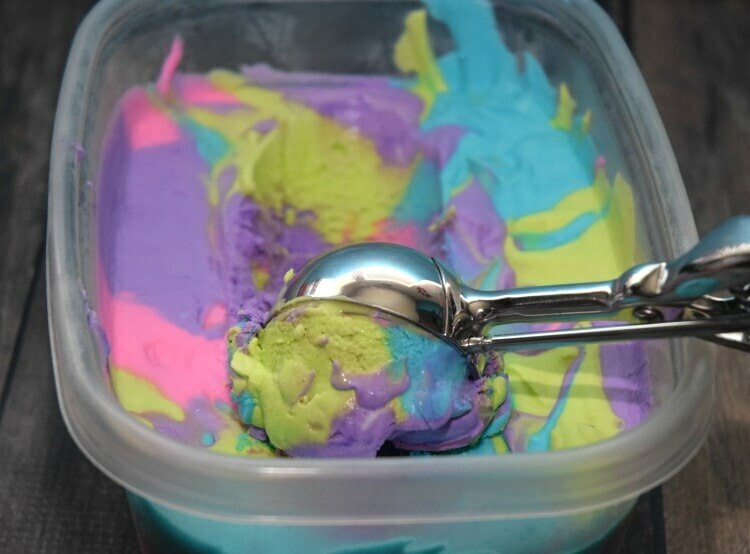 Drop heaping spoonfuls of each color, overlapping one another, in the freezer container for the ice cream. 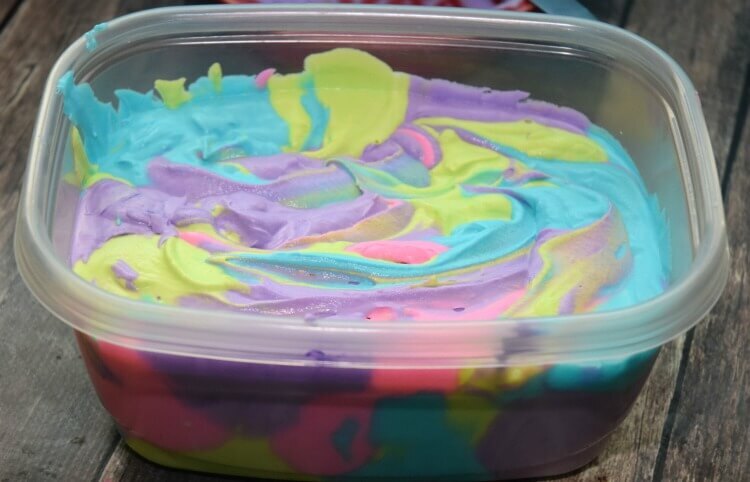 When you’ve added all the colors, tap the container on the counter until the cream mixture is smooth on top. This will mix the colors a bit. Cover and freeze for at least 8 hours, and best overnight. My daughter loves unicorn everything! 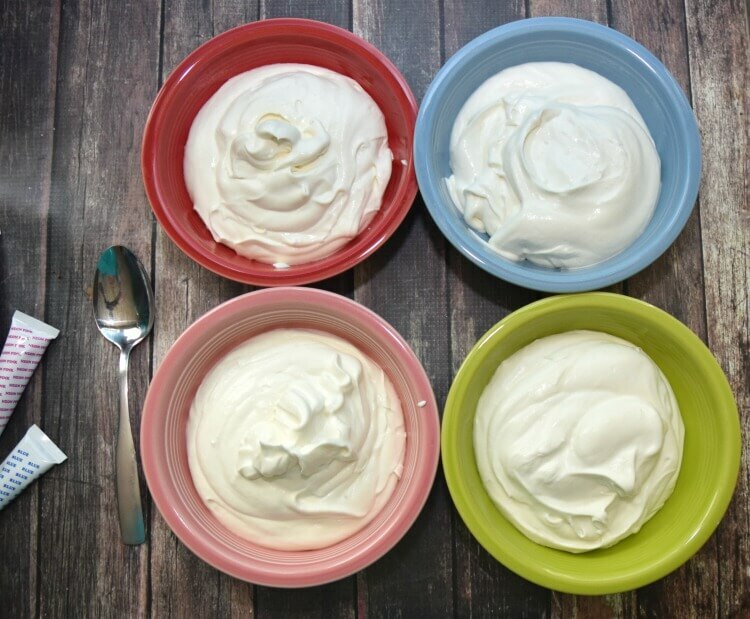 I can’t get over how fun this ice cream recipe is – and so easy too! I love it! Thank you so much for joining me in Ice Cream Week!!! Yum! I want some! I love the fun color combination! Wow! 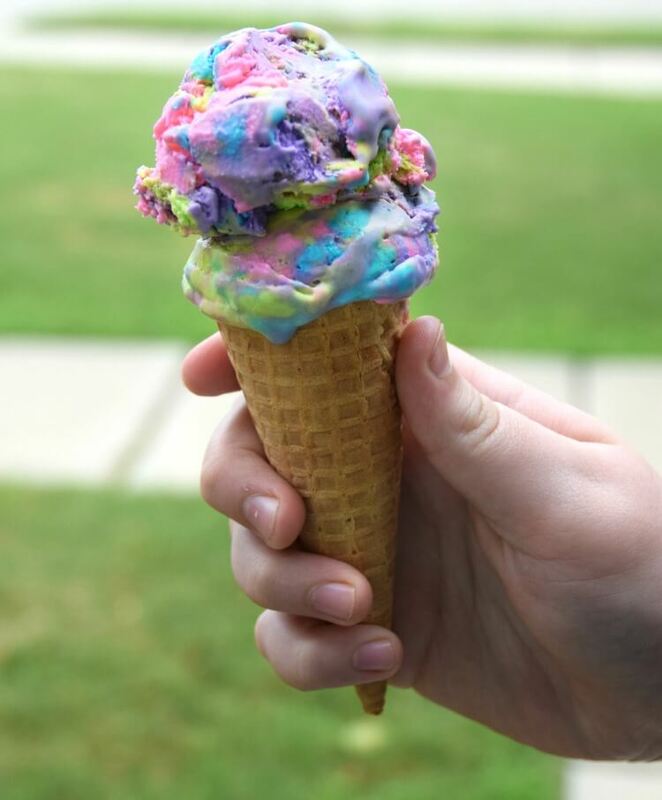 Love all the colors in this ice cream. It’s so fun and festive! 6-24-2016 I accidentally put my tweet instead of my pin in the Smores ice cream box, sorry! What a beautiful ice cream!! Seriously in love with the name – I love unicorns! I’m curious to know how firm this ice cream sets up considering it’s a no Churn ice cream. 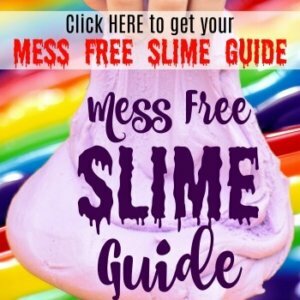 I have made a no churn recipe before, and it turned out to be a big gloppy mess. It takes a few hours to freeze, but it’s just as hard as churn ice cream when I pull it out of the freezer. I tend to leave it in the freezer overnight before serving it so it’s completely frozen.